Mink is the common name for semiaquatic carnivorous mammals of the two extant Mustelidae species Mustela lutreola (European mink) and Neovison vison (American mink; synonym Mustela vison) and one recently extinct species, Neovison macrodon (sea mink; synonym Mustela macrodon). Minks are characterized by a slender body, arched back, long neck, short ears, pointed snout, short limbs, bushy tail, and webbed feet. Minks have been valued historically for their thick and shiny fur, which remains a luxury good to this day, used in clothing such as coats and jackets. Hunting and trapping of wild mink has given rise to large-scale farming. On the one hand, this farming is viewed as relieving over-harvesting pressures on wild populations. The sea mink, for example, was hunted to extinction, largely as a result of the competitive fur trade (Day 1981). However, on the other hand, the treatment of minks on fur farms remains a focus of animal welfare activism. American mink have found their way into the wild in Europe (including Great Britain) and South America, after being released from mink farms, either due to escapes or by deliberate release by animal rights activists. Release of farmed mink may be misguided, as most die within two months (Hammershøj 2004) and the release of large numbers of mink in the ecosystem generally has negative environmental consequences. In Europe, American mink are believed by some to have contributed to the decline of the smaller European mink through competition. The European mink today is considered one of the most endangered mammals in the world. Trapping is used to control and eliminate any feral American mink. In addition to the commercial and aesthetic values contributed by mink, in the wild they also offer important ecological values. These largely nocturnal predators are important components of food chains, preying on a wide range of aquatic and waterside animals, including fish, crayfish, frogs, birds, snakes, voles, rabbits, and waterfowl, and being consumed by such predators as coyotes, wolves, and birds of prey (such as the great horned owl). Minks are members of the Mustelidae family of the mammalian order Carnivora. The Mustelidae family includes 55 species of weasels, badgers, and otters), placed in 24 genera. This "weasel family" is a diverse family and the largest in the order Carnivora, at least partly because it has in the past been a catch-all category for many early or poorly differentiated taxa. Within a large range of variation, the mustelids exhibit some common characteristics. They are typically small animals with short legs, short round ears, and thick fur. There are two living species of mink, the European mink and the larger American mink. The extinct sea mink is related to the American mink, but is much larger. All three species of mink are dark-colored, semi-aquatic, carnivorous mammals. It is sometimes possible to distinguish the European and American species based on the fact that the American mink usually lacks a large white patch on its upper lip, while the European mink always possesses one. Any mink without such a patch can be identified with certainty as an American mink, but an individual with such a patch, if encountered in continental Europe, cannot be certainly identified without looking at the skeleton. The European mink always and the American mink usually has a white spot on the lower lip, which continues in broken or unbroken fashion to form ventral markings. Since each is a different shape, it is possible to recognize individuals based on these ventral patterns. Taxonomies often place all three species as part of the Mustela genus, a taxonomic group that is known collectively as weasels, and includes about 17 species of animals known commonly as ermines, ferrets, minks, polecats, and weasels (ITIS 2006e). However, according to cytogenetic and biochemical data, there are significant differences between the American mink and other species listed in Mustela—differences greater than that among Mustela species—and thus recent taxonomies separate the American mink into its own genus as Neovison vison (ITIS 2006a). The sea mink (Neovison macrodon), which is now extinct, likewise is often listed as Mustela macrodon, and is listed as extinct by IUCN as M. macrodon, but is similar to Neovison vision, and indeed is considered by some to be conspecific with N. vison (ITIS 2006b). Mink first entered Europe from America at the end of the Pleistocene Ice Age. The two extant species are believed to have diverged only in the last ten thousand years, and therefore remain remarkably similar in a number of ways (Birks 1984). The European mink, Mustela lutreola, is a European member of the Mustelidae family found in some regions of Spain, France, Romania, Ukraine, Estonia, and the greater part of Russia, though not found east of the Ural Mountains. Formerly it extended across all Europe, reaching Finland in the north, but it is now extinct in the major part of its ancient range. It is similar in appearance to the American mink. European mink have slender, flexible bodies, bushy tails, and webbed paws. They have a sleek summer coat, and a darker, denser, winter coat, better suited to low temperatures. Their eyesight is generally poor, so that they rely heavily on their superior sense of smell while hunting (Birks 1984). In addition to having a large white patch on its upper lip and a white spot on the lower lip, fur also grows white over a scar. Older mink tend to have more such patches of white from scarring, although absolute age is difficult to quantify without studying the animal from birth. In fur farms, mink are generally slaughtered after eight months, but can live several years in the wild (although mortality is high, especially among dispersing juveniles). Male European mink are from 28 to 43 centimeters in body length, and weight about 900 grams, while the females are only slightly smaller at 30 to 40 centimeters long and 600 grams in weight. These sizes are somewhat smaller than those for the American mink (Birks 1984). European mink are solitary animals, and live in dens close to fresh water. They range over an area of shoreline or riverbank up to four kilometers in length, and defend the territory with a combination of scent marking and physical aggression. They are carnivores, and prey on a wide range of aquatic and waterside animals, including fish, voles, rabbits, and waterfowl. In breeding seasons, typically from February to March, males leave their dens and travel considerable distances in search of a mate. Mink are promiscuous and both males and females mate with several different individuals over the course of the season. The female gives birth to four to six naked, blind, "kits" after a average gestation period of 49.66 days to 51.7 days (Stevenson 1945). This process may appear longer due to delayed implantation. The young kits are weaned at eight to ten weeks, and leave to establish their own dens at three to four months. They are sexually mature in time for the breeding season the following year (Birks 1984). The European mink is one of the most endangered mammals in the world. The endangered western population of European mink Mustela lutreola has shown a large decline over their natural range. 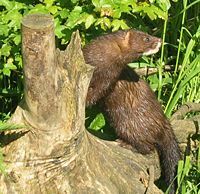 The species has been extinct in central Europe since the beginning of the century and the mink's range is actually fragmented into two population units: an eastern population unit ranging from the Urals and Estonia to the Black sea, a population which is already subdivided into small units, and a western population. Inhabiting mainly forest brooks, the European mink occupies an intermediate semi-aquatic niche between the European polecat Mustela putorius and the otter Lutra lutra. A trend in recent years has been the release of farmed minks into the wild, including by animal rights activists. The result of the introduction of the American mink into the wild in Europe has been disastrous for the European mink, who occupies almost the same ecological niche but is outcompeted by the larger and better-swimming American species. Attempts are now underway to introduce the European mink to islands too far from the continent for American mink to swim to, in an attempt to safeguard the species from becoming extinct. Although natural hybridization events between two native species is regarded as an exceptional event, the European mink and European polecat are able to hybridize and their hybrids are fertile (Lodé et al. 2005). A wild American Mink, Lower Saranac Lake. The American mink, Neovison vison, is found in Alaska, Canada, and most of the mainland United States, with a range from Florida to the Arctic. An endangered subspecies, the Everglades mink (Mustela vison evergladensis), is endemic to the Florida Everglades. A domestic form of American mink has also been raised in fur farms for their lustrous fur, which is highly esteemed. Breeders have developed a range of colors from deep black to white. The American mink has a long, slim body and short legs. They have partially webbed feet, which make them excellent swimmers. Their bodies are covered in glossy, thick dark brown fur. They can be found in wooded areas and fields near streams and lakes. They do not dig burrows, but instead take over dens abandoned by other animals. Mink are semi-aquatic predators able to hunt both aquatic and terrestrial prey. They can dive under water like an otter to capture fish, crayfish, and frogs. They can also capture terrestrial prey like birds, snakes, mice, voles, and rabbits. Mink are generalist predators focusing on what ever prey is most available and easily captured. These animals are mainly active at night and do not hibernate. Their predators include coyotes, Great Horned Owl, and wolves. They are also trapped for their fur. The numbers of American mink in the wild have been reduced due to loss of habitat, the effects of pollution on their aquatic food supply, and the mixing of domestic mink genes into the wild mink gene pool (Bowman et al. 2007). American mink are usually solitary animals. Mating occurs from early February through early April; males and females may have more than one partner. Females give birth to 4 to 5 kits per litter once a year. While mortality is extremely high in the early months of the life of the American mink, animals that do survive the first year can live as long as three years in the wild and have been known to live 10 to 12 years in captivity. The subject of fur farming is contentious. Various people argue that fur farming is cruel to the animals and should be eliminated completely. Some argue that fur farming is an acceptable enterprise, and yet others assert that it is a necessary evil, claiming that it not only provides furs for warmth but also protects wild fur bearers from over harvest. For example, before fur farming was developed, some animals, such as the sea mink, were driven to extinction due to over harvesting for their fur. Many other animals, like the fur seal, sea otter, river otter, and beaver, had their populations drastically reduced from over harvesting. It is contended that if fur farming were eliminated, the price of fur might increase and wild fur bearing animals might again be in danger of over harvest. A 2006 study in Denmark concluded that, due to frequent escapes from existing mink farms, “Closing mink farms may result in a crash of the free-ranging population, or alternatively it may result in the establishment of a better-adapted, truly feral population that may ultimately outnumber the population that was present before farm closures” (Hammershøj et al. 2006). The study reported that more information would be necessary to determine the outcome. Evidence also has been gathered that a significant majority of the “wild” mink were mink that had escaped from fur farms, and that 47 percent had escaped within two months, 31 percent had escaped prior to 2 months, and another 21 percent may have or may not have been born in nature” (Hammershøj et al. 2004). In recent years, animal rights activists have also released several thousand domestic mink causing negative environmental consequences. Domestic mink, which are bred in fur farms, are different from wild mink. Domestic mink are found to have 19.6 percent smaller brains, 8.1 percent smaller hearts, and 28.2 percent smaller spleens than wild mink do (Kruska and Schreiber 1999; Kurska 1996). Because of these physical differences, domestic mink may not be suited for life in the wild. A University of Copenhagen study found that most domestic mink that escape from fur farms die in less than two months (Hammershøj 2004). This data is contested by Hammershøj and Forchhammer (2004), who studied the survival rate of escaped mink in Denmark, then compared that data to similar studies in the United States and Sweden. The authors concluded that the survival rate for recently released mink is lower than for wild mink, but if mink survive at least two months, their survival rate is the same as for wild mink. The authors suggest that this is due to the rapid behavioral adaptation of the animals. Domestic mink are larger than wild mink, which may cause problems with the ecosystem when they escape. Mink are solitary, territorial animals and are intolerant of other mink. In times of overpopulation, mink control their own numbers by either killing each other through direct conflict or by causing weaker mink to be driven from territory until starvation sets in (Dunstone 1993). When hundreds or thousands of released domestic mink flood an ecosystem, it causes a great disturbance for the wild mink. This disturbance causes the deaths of the majority of the released mink and many of the wild mink. Most of the released and wild mink in the area die slow deaths, due to starvation, or from injuries from the unnaturally high number of mink fighting for a territory (Dunstone 1993). When a domestic mink survives long enough to reproduce, it may cause problems for the wild mink populations (Bowman et al. 2007). The adding of weaker domestic mink genes into wild mink populations, is believed by some, to have contributed to the decline of mink populations in Canada (Bowman et al. 2007). Some American mink have established themselves in the wild in Newfoundland, Europe, and South America due to escapes or intentional release by animal rights activists from fur farms. In parts of Europe, tens of thousand were intentionally introduced by the Soviet Union over a period of several decades, to provide a new game animal for trappers, with disastrous population declines of the European mink as result. The larger American male will mate with European mink females earlier in the spring than the males of the same species; no offspring are born, but the females are believed to not breed again that season. This is believed by some, to have contributed to the decline of the European mink. Despite the fact that they are inquisitive, playful and cute, mink do not make good pets for the average person because they have strong jaws, very sharp teeth, can be highly aggressive, and are very active. Most people do not have the knowledge, or the patience to properly care for a pet mink. Even though domestic mink have been bred in captivity for around a hundred years, they have not been bred to be tame. Domestic mink have been bred for size, fur quality, and color. However, the Fur Commission of the USA claims that "mink are truly domesticated animals" based on the number of years they have been kept on fur farms (FCUSA 2007). The belief that mink are completely untameable is not true ether. Mink can be tamed and kept as pets, but it is a difficult process. Individuals with lots of time, patience, and experience with wild animals, have successfully kept mink as pets. The sea mink, Neovison macrodon, is an extinct North American member of the Mustelidae family. It is the only mustelid, and one of two mammalian carnivore species to have gone extinct in historic times, along with the Falkland Island Fox. It was significantly longer than the closely related American mink (N. vison), and also larger and fatter, leading to a pelt that was around twice the size. The longest specimen recorded was said to be 82.6 centimeters (32.5 inches) in length. The fur of the sea mink was said to be coarser and redder than the American mink's, and give off a distinctive odor (Day 1981). 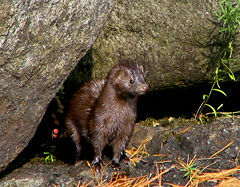 The sea mink was found along the rocky coasts of New England and Atlantic Canada, as far north as Nova Scotia. It was not a truly marine species, being confined to coastal waters. Although well known to fur hunters, it became extinct before being scientifically described, and therefore little is known about its habits. Existing data suggests it was nocturnal and solitary (Maas 2007). The sea mink is sometimes considered to have been a subspecies of the American mink, in which case the name Neovison vison macrodon is used. Due to its highly-prized fur, it was hunted to extinction. The animal's remains are often found in Native American shell-heaps on the coasts of the islands of Maine, but while indigenous hunting may have had some contribution to the sea mink's decline, it was the competitive European fur trade that is considered to have led to its extinction (Day 1981). Another possible contributing factor may have been the extinction of the Labrador duck, with which it co-existed, and which may have been a prey item. The last known member of the species was said to have been captured in New Brunswick, New Jersey in 1894, although there is some debate if this was a specimen of N. macrodon or N. vison. The last substantiated report has led to an estimated extinction date of around 1860 (Maas 2007), although a specimen was reported as sold to a fur-buyer in Maine in 1880 (Day 1981). Birks, J. 1984. Mink. Pages 116-117 in D. Macdonald (ed. ), The Encyclopedia of Mammals. New York: Facts on File. ISBN 0871968711. Bowman, J., A. Kidd, R. Gorman, and A. Schulte-Hostedde. 2007. Assessing the potential for impacts by feral mink on wild mink in Canada. Biological Conservation 139: 12-18. Day, D. 1981. The Encyclopedia of Vanished Species. London: Universal Books. ISBN 0947889302. Dunstone, N. 1993. The Mink. London: T. & A.D. Poyser. ISBN 0856610801. Fur Commission USA (FCUSA). 2007. Mink farming in the United States. Fur Commission USA. Retrieved June 19, 2008. Hammershøj, M. 2004. Population Ecology of Free-ranging American Mink Mustela vison in Denmark. Ph.D. Thesis. National Environmental Research Institute. ISBN 8777728017. Hammershøj, M., J. M. J. Travis, and C. M. Stephenson. 2006. Incorporating evolutionary processes into a spatially-explicit model: exploring the consequences of mink-farm closures in Denmark. Ecography 29(4): 465-476. Retrieved June 19, 2008. Hammershøj, M., C. Pertoldi, T. Asferg, T. B. Møller, and N. B. Kristensen. 2004. Danish free-ranging mink populations consist mainly of farm animals: evidence from microsatellite and stable isotope analyses. Article II (p. 26) in M. Hammershøj, Population Ecology of Free-ranging American Mink Mustela vison in Denmark. Ph.D. Thesis. National Environmental Research Institute. ISBN 8777728017. Hammershøj, M., and M. C. Forchhammer. 2004. Survival rates of free-ranging farm mink suggest quick behavioural adaptation to natural conditions. Article III (p. 27) in M. Hammershøj, Population Ecology of Free-ranging American Mink Mustela vison in Denmark. Ph.D. Thesis. National Environmental Research Institute. ISBN 8777728017. Integrated Taxonomic Information System (ITIS). 2006a. Neovison Baryshnikov and Abramov, 1997. ITIS Taxonomic Serial No. : 726247. Retrieved June 19, 2008. Integrated Taxonomic Information System (ITIS). 2006b. Neovison macrodon (Prentis, 1903). ITIS Taxonomic Serial No. : 726283. Retrieved June 19, 2008. Integrated Taxonomic Information System (ITIS). 2006c. Neovison vison (Schreber, 1777). ITIS Taxonomic Serial No. : 726284. Retrieved June 19, 2008. Integrated Taxonomic Information System (ITIS). 2006d. Mustela lutreola (Linnaeus, 1761). ITIS Taxonomic Serial No. : 621951. Retrieved June 19, 2008. Integrated Taxonomic Information System (ITIS). 2006e. Mustela Linnaeus, 1758. ITIS Taxonomic Serial No. : 180552. Retrieved June 19, 2008. Kruska, D. 1996. The effect of domestication on brain size and composition on the mink. J.Zoo., Lond 239: 655. Kruska, D., and A. Schreiber. 1999. Comparative morphometrical and biochemical-genetic investigations in wild and ranch mink. Acta Theriologica44 (4): 382. Lodé, T., G. Guiral, and D. Peltier. 2005. European mink-polecat hybridization events: Hazards from natural process. Journal of Heredity 96(2): 1-8. Maas, P. 2007. Sea mink. The Extinction Website. Retrieved June 19, 2008. Stevenson, W. J. 1945. The gestation period of mink. Canadian Journal of Comparative Medicine 9(2): 28-39. Retrieved June 19, 2008. This page was last modified on 25 June 2008, at 03:26.